Termites Commonly known as white ants, termites destroy valuable property, documents, furniture and furnishings…anything that contains cellulose, silently and swiftly, before you even become aware of the damage done. Termites infest and breed underground, in the soil. They crawl up through the minute cracks and crevices in the foundation and the walls of your building. As they march forward, they build mud channels to provide themselves with darkness and higher humidity which they require to survive. When you notice such marks on your walls you get an indication that your house is under attack by white ants. Rajashree Pest control provides the best termite pest control treatment with the help of latest technology and as per the IS standards. Five Years Anti Termite Pest control Contract for your entire building and avail of a five years warranty against termites. Ten years Anti Termite Pest control contract Pre- Construction soil treatment.Warranty on stamp Paper. Method of Treatment: To stop and prevent the movement of termites from the ground, hole s are drilled from inside your premises at the junction of the wall and the floor at an angle of 45 degrees. The holes are drilled along the side of the entire outer wall at approximately 500 mm (20 inches) intervals. The termite control insecticide is then poured into these holes to soak the masonry. If your premises are on the ground floor, the partition walls are also treated. The termite control drilling operation is not carried out on the partition walls above the ground floor because the RCC slabs act as a mechanical barrier and the termites cannot penetrate them. Holes drilled at the base of the wall premises. The wood work in contact with the masonry in a building is particularly susceptible to termite infestation, such as door and window frames, wall panels, wardrobes, shelves, wooden cupboards, etc. Holes of diameter 12 mm (1/2" approx.) are drilled slanting towards the core of woodwork at a distance of 500 mm (20"). Insecticide is then poured into these holes. Special oil based chemical is sprayed on all vulnerable unpainted woodwork. Check Up Visits: After the initial major termite treatment, our operator will visit your premises for a check up once in every quarter, after prior intimation by call. Necessary treatment will be carried out in case of any re-infestation. You can call us whenever there is a reappearance of termites during the contract period. Time Required to Carry Out the Treatment: On an average for termite treatment it takes two of our operators about 2 hours to treat an area of 500 to 1000 sq. ft. and about 6 hours (1 day) for an area of about 2000 sq. ft. The soil around the foundation of your building (Termite control Treatment - External). The base of the masonry walls (Termite control Treatment - Internal). All vulnerable wooden portions of the building. If there exists a concrete cover or masonry apron around the walls of your building, holes are drilled as close as possible to the plinth wall about 300mm (1ft) apart from each other and 300mm deep. Water diluted insecticide (Premise- Bayer) is then poured inside the holes with a rate of 300-500ml/hole, so that it reaches the soil form a chemical barrier which eliminates the termites present there and to stop them from re-infesting. If your building is on pillars, the holes are drilled around the pillars and insecticide poured into the soil. If there is loose earth around the walls of your building, trenches of a 'shovel width' are dug, exposing the external surfaces of the foundation wall upto a depth of 500 mm from the ground level. The Base of the Masonry Walls (Internal Anti Termite Treatment): To stop and prevent the movement of termites from the ground, holes are drilled from inside your premises at the junction of the wall and the floor at an angle of 45 degrees. The holes are drilled along the side of the entire outer wall at approximately 500 mm (20 inches) intervals. The insecticide is then poured into these holes to soak the masonry. If your premises are on the ground floor, the partition walls are also treated. The drilling operation is not carried out on the partition walls above the ground floor because the RCC slabs act as a mechanical barrier and the termites cannot penetrate them. Termites, which originate from the soil, are controlled effectively when your building is treated at the ground level as per the above mentioned method. But, as an additional precaution, the outer walls on the first floor are also subjected to the masonry drilling treatment. Above the first floor, the drilling operation is carried out at a distance of approximately three fts distance. All flats will be treated. Staircase will be drilled upto second floor. 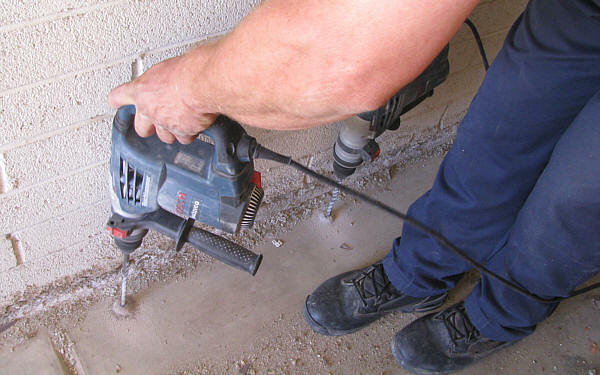 Further, on all floors, wood work like doors and windows frames in contact with the masonry in a building, which are highly susceptible to termite attack are also protected by treating them with the spot drilling operation. Spot treatment of spraying on infested areas in the walls and ceiling is also carried out. On completion of the initial treatment, about 80% of the termites are eliminated from your building. The remaining termite which is hidden in the walls is eliminated within 6 months, during the check up visits of our operator. In remote cases, it may even take 2 years to eradicate the termites. 5 Years - In case of comprehensive Anti Termite pest control treatment of the entire building, we give a warranty of five years. Any re-infestation of termites during the warranty period is treated without any extra charge. After initial termite pest control treatment a check up of the entire building is carried out every month for the first six months. A check up is carried out once every six months for the next four years. Intimation will be given in advance by post about the time of arrival of our operators. The check up visit is to find out whether there has been any re-infestation of termites. Necessary treatment will be carried out in case of re-infestation. You can call us as and when there is re-infestation during the entire contract period of five years. On an average it takes two of our operators about 8-12 days to complete entire building, depends upon the availability. If you are planning to build a house or develop your property for building your office or bunglow, termite treatment is the first thing you should think of. We use highly professional and advanced techniques for termite control. Direct liquid treatments are applied to the outside, inside and also in the foundation to eliminate the termites completely. Direct injection of liquid pesticide in areas like the foundation, within the foundation walls and also areas under the concrete slabs is part of our specialized termite control treatment plan. 1. We treat the sides and bottom surface of the foundation trenches and pits with chemical to a height of about 3 0cm at the rate of 5 Lit. per square meter of surface area. 2.Backfill earth on each side of all built up walls, which will be in immediate contact with the foundation, should be treated with chemical at the rate of 7.5Lit. per linear meter of vertical surface of the substructure, to a depth of 45cm and width of 15cm. The chemical shall be directed towards the masonry surfaces so that earth in contact with these surfaces is well treated with the chemical. Before laying the floor, treat the top surface of the consolidated earth within the plinth walls with chemical at the rate of 5lit.per square meter. 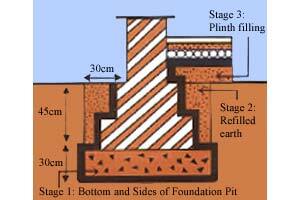 Ensure back fill against foundation is treated to its full depth. For Pre-Construction Anti Termite control treatment Rajashree Pest Control will provide you the Warranty period of 10 years for Termite Control on legal stamp Paper.